Thought you left breakouts and blemishes behind with high school? Think again! According to the American Academy of Dermatology, more than half of women over 25 still struggle with embarrassing acne. Adult acne is significantly different than the breakouts you had in high school. Teenage acne usually appears in the middle of the face along the T-zone and the acne lesions are easier to extract, because they sit right under the surface of the skin. In contrast, adult acne is usually on the chin and along the jawline, appearing as deep cysts, which can’t be extracted. So what’s causing our embarrassing zits as adults? The main culprit is fluctuating hormone levels: premenstrual dips in estrogen and fluctuations that occur during peri-menopause can cause – or worsen – breakouts. 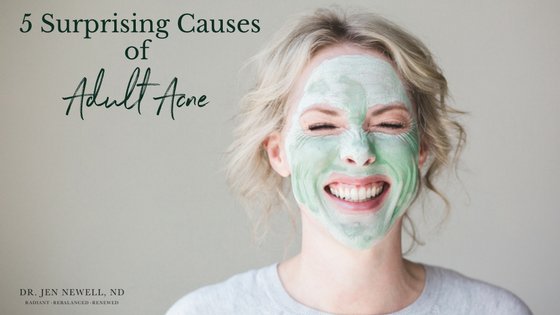 In addition to hormonal changes, there are other surprising causes of acne in adulthood to consider. Our makeup, skin care regimen, food choices, cell phone, and traveling may also be to blame. The good news is, we have control over these factors and can make changes. Here are 5 surprising causes of adult acne and ways to remove them from your lifestyle. You should consider and evaluate all of your hair products if your breakouts are concentrated on the hairline, forehead, jawline, neck, behind the ears or upper back. Whatever you put in your hair will migrate onto your skin. Many times, what you’re using on your hair winds up on your face, especially if you use products with spray applicators. In fact, breakouts caused by styling products are so common, there’s a name for them: “pomade acne.” Your hairstyle also matters: bangs/fringe can make acne worse by bringing skin-clogging hair products right against your forehead. Check the ingredients in your shampoo as well, despite rinsing it out it deposits residue from sodium sulfates (aka “sodium laureth sulfate” and “sodium lauryl sulfate”) on your skin that contribute to acne. Save Your Skin: Choose your shampoo wisely (avoid sodium sulfates), and wash your face (and chest or back, if they’re acne-prone) after rinsing your shampoo and conditioner. The average woman tries 5-10 new skincare products a year. That’s great news for the cosmetic industry, but bad news for your skin. Here’s why: Most department store and drugstore-brand skin care products are contributing to your acne, because they contain comedogenic (pore clogging) ingredients like isopropyl myristate or laureth-4. Unfortunately, there are no regulations in place regarding the use of the label “non-comedogenic”. Learn more about comedogenic ingredients here. Save Your Skin: Whether your goal is to prevent wrinkles or zap zits, review the ingredient list carefully if you’re acne-prone. Stop dabbling in new skincare products searching for a miracle and discuss your skin’s needs with a professional with an awareness of ingredients to avoid and personal care products. As teens and adults, we have been led to believe that greasy, oily foods like French fries cause our pimples, but it’s the salt that’s really contributing to the development of your zits. That’s because regular table salt contains iodide, and acne-prone pores get red and inflamed as we eliminate excess iodides out of our body. Another dietary acne trigger is the consumption of a high carb diet. Research has found that carbohydrates with a high-glycemic index (for example, soda, sugary snacks, and junk food) increase the development and severity of breakouts. Save Your Skin: Cut back on salty, high carb snacks like bread and chips and load up on veggies and fruits, grass-fed meats, and pasture-raised eggs. All that on-the-go chatting is great, keeping you in touch with friends, family and the office. But it might be damaging your complexion. Throughout the day, cell phones are exposed to many surfaces, including your dirty fingers, which have bacteria on them. When you’re talking on your cell phone, you’re putting bacteria close to your mouth and cheek (especially if you have a smart phone), and the warmth and moisture create the perfect environment for that bacteria to thrive, grow and cause acne on your face. Save Your Skin: Clean your phone daily to remove bacteria and residue from make up; creams and lotions; and environmental pollution. It is also skin protective to use your headset or speaker phone. Travelling can trigger adult acne. The change in humidity, weather or even the water used for washing your hair and face can all lead to breakouts. Vacation and traveling also lead to changes in your routine and more indulgences that can cause breakouts (think alcohol, rich food, late nights, etc). Save Your Skin: You can’t control the weather where you visit, so be especially careful about other causes of adult acne while you’re on the road. Limit your indulgences but still have fun and try to remain aware of the other adult acne triggers in this list. If you have tried everything and are still struggling with adult acne then it may be best to seek support from a Naturopathic Doctor to get a more holistic plan to address your concerns – a plan that takes into account the various aspects of your life contributing to the health of your skin. The most comprehensive treatment plans for adult acne include strategies to resolve the root cause of acne from the inside out and to nourish and treat the skin from the outside in. Learn more about my approach to skin health here.